It’s time to tell the British Museum: no more BP! – BP or not BP? It’s time to tell the British Museum: no more BP! Posted on September 23, 2014 by BP or not BP? Gross Negligence from rikki on Vimeo. This is the eighth time we’ve performed inside the Museum to challenge their sponsorship partnership with the world’s biggest corporate criminal, BP. We’ve raised the profile of the issue and have definitely got their attention. But if we’re going to kick big oil out of the Museum for good, then we need to step things up. 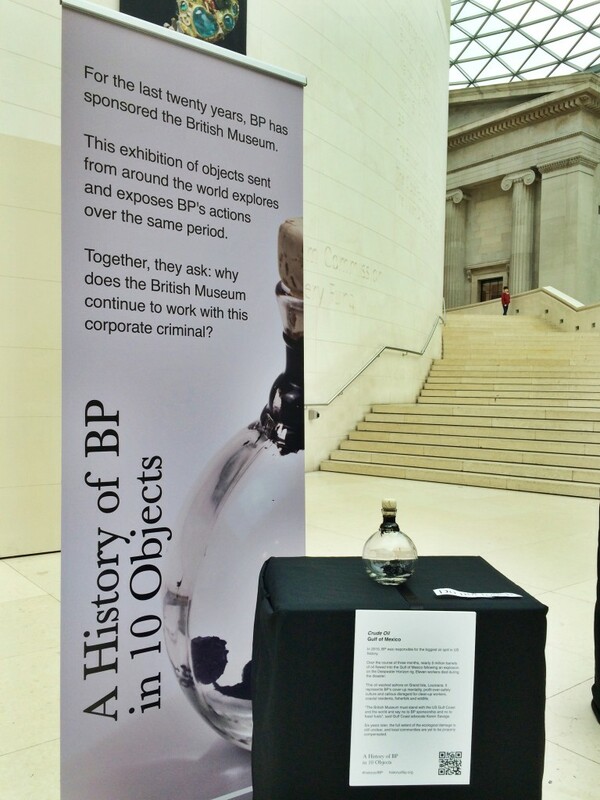 The sponsorship deal between BP and the British Museum (as well as the Tate, Royal Opera House and National Portrait Gallery) is due to run out in 2016. Discussions about renewing that deal may have already begun, so we need to pile pressure on these institutions right now. It doesn’t have to be very long, just explain in your own words why you are unhappy about the Museum’s choice of sponsor. If you need a bit of inspiration or some facts and figures, there’s some extra information below. 2) Sign and share our petition to Museum Director Neil MacGregor. 3) Join our next performance. Just email us at info@bp-or-not-bp.org to find out how. Yes, we’re looking at you now, The British Museum! Why challenge oil sponsorship of arts and culture? Oil companies like BP are lobbying against environmental laws and blocking clean energy alternatives all over the world. Their aim is to keep on making money while the rest of us suffer the consequences of their endless quest for dirty fuels. Sponsoring arts and culture helps BP get away with these deeply dodgy practices. By taking oil money, cultural institutions like the Tate, the National Portrait Gallery, the Royal Opera House, the Royal Shakespeare Company and the British Museum are helping to hide their sponsors’ real activities and making them look like caring, responsible companies rather than the tar-drenched oily rogues they really are. In 2010 BP’s Deepwater Horizon offshore oil rig exploded, killing 11 workers and pouring millions of barrels of oil into the sea. This destroyed the livelihoods of thousands of people and caused irreversible damage to wildlife and the environment. Despite this, BP is now pushing to drill in ever-more risky and polluting places, from deep offshore rigs to tar sands to the Arctic. BP has also been accused of trampling over indigenous rights in Canada and colluding with oppressive regimes from Indonesia to Colombia. Is this really an appropriate partner for respected institutions like the British Museum? BP admits that continuing to extract and burn oil will lead to disastrous climate change, but according to its own annual report it is hoping to keep on digging up and selling the stuff until we’ve passed the point of no return. Experts tell us that with renewable energy we could power the world without fossil fuels – but that would mean less profit for the likes of BP. BP provides just 3% of the income of the National Portrait Gallery, and less than 1% of the annual income of the Tate, British Museum and Royal Opera House. In return, it receives a huge amount of branding and positive publicity. Big pension funds, universities, churches, foundations and even city councils are starting to break their financial links with fossil fuels. It’s time our cultural institutions did the same. We are a theatrical protest group called “BP or not BP?” We formed in 2012 to challenge BP’s sponsorship of the Royal Shakespeare Company with a series of Shakespearean stage invasions before BP-sponsored plays. We now carry out pop-up performances at a variety of oil-sponsored institutions, including a series of Viking invasions at the British Museum’s BP-branded Vikings Exhibition. We always need new members and supporters, no performance experience is required! Facebook: BP or not BP? Part of the Art Not Oil Coalition.